A classic expression of this revered variety, from vine stocks originating at the grand chateaus of Bordeaux. 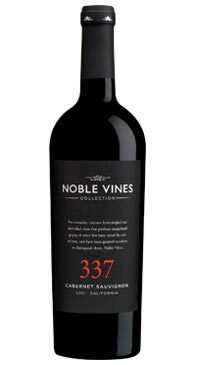 Noble Vines 337 Cabernet Sauvignon exhibits lively aromas of black cherry, ripe currant, fresh herbs and lightly roasted coffee. Supple tannins and balanced acidity support core flavours of blackberry, black cherry and toasty oak, intertwined with spicy black pepper accents. It is rich and complex, and so may be enjoyed on its own or with a range of cuisine.